Community gardens are a unique form of open space whereby people can learn, recreate, socialise and demonstrate sustainable principles within a garden setting. 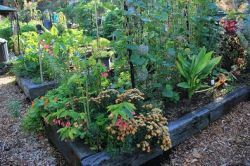 Community gardens are not-for-profit, and can provide for a wide range of environmental, social and economic benefits. On 12 December 2011, Council adopted the Community Gardens Policy - 2011 (PDF) with the inclusion of Community Verge Gardens. 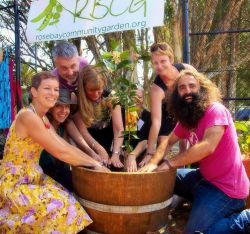 The Rose Bay Community Garden was established in 2014 and provides a space to create a beautiful garden for the local community, where people can learn, socialise, have fun, and grow organic fruit and vegetables. The Rose Bay Community Garden is located next to Woollahra Park at the end of Manion Ave, Rose Bay. The site is fenced and includes individual allotments, shelter and a shed. The site will also be utilised by Council's Sustainability and Waste teams to conduct community workshops, presentations and community tours. For membership enquires and more information on the Rose Bay Community Garden visit the Rose Bay Community Garden Facebook page. Paddington Community Garden at Trumper Park was established in 2008. It is located at the rear of the Palms Tennis Courts, adjacent to the Council Nursery, and access is from Quarry Street. The site is fenced and includes individual allotments, a shelter, water tanks and seating. The site is also used by Council’s Sustainability and Waste teams to conduct community workshops, presentations and community tours. For membership enquires and more information on the Paddington Community Garden visit the Paddington Community Garden website. The Cooper Park Community Garden was established in 2017 and provides a space to create a beautiful garden for the local community, where people can learn, socialise, have fun, and grow organic fruit and vegetables. It is located next to Cooper Park Scout Hall on Cooper Park Rd, Bellevue Hill. The site is fenced and includes individual allotments and a shed. The site will also be utilised by Council's Sustainability and Waste teams to conduct community workshops, presentations and community tours. For membership enquiries and more information on the Cooper Park Community Garden, visit the Cooper Park Community Garden Facebook page or visit their website. A communal garden is an open space, with no locked gates or fences, no individual garden plots, and no formal memberships (however it is generally managed by a committed group of local residents). 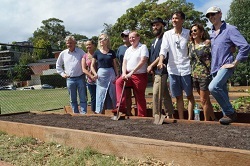 Due to a growing interest in community gardening, and the need to conserve our precious water supplies, this garden was developed by Woollahra Council to act as a demonstration site for how rainwater can be used to grow and sustain a garden, and to allow the local community to grow and harvest their own local, organic produce. The garden is located at 64 Holdsworth St, Woollahra (at the rear of the Holdsworth Community Centre) and can also be accessed at the end of Spicer Lane, Woollahra. The gates are unlocked 24/7 and anybody from the community is welcome to have input into, and harvest from, the site. For more information on the Holdsworth Communal Garden visit the Holdsworth Communal Garden Facebook page. The Windsor Street Communal Garden is located at the end of the Windsor St Cul-de-sac in Paddington. A resident group established this space in 2011 and maintains the edible garden for the enjoyment and education of local residents. They wish to encourage community involvement and neighbourly cooperation in further developing the organic garden and distribution of produce. Wander down and take a look! 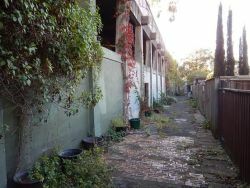 The Windsor Laneway Communal Garden is located in Windsor Lane, off Cascade Street in Paddington. In 2015, a group of local residents saw the opportunity to clean up their local laneway and create a beautiful communal garden. They wish to create a cleaner, healthier space where neighbours and visitors can meet, learn and grow the urban garden. Verge Gardens are garden beds that are established on the nature strip, or road reserve that are managed by an individual, or group of local residents. On 12 December 2011, Council adopted the Community Gardens Policy (PDF) with the inclusion of Community Verge Gardens. Council supports the planting of verge gardens which make a positive contribution to the local streetscape, provided property owners receive consent from Council and maintain the verge outside their property in line with the consent conditions. Complete the Verge Garden Installation Application Form (PDF) and return it to Council. Wait for a written Notice of Determination from Council detailing the application outcome. If consent is granted, install and maintain the garden in line with the approval conditions. Assess the application to ensure the proposed garden meets the criteria for consent. Seek additional information or community consultation if required. Provide a written Notice of Determination to the applicant advising if the proposed garden has been provided consent and any associated conditions. For more information about Community, Communal and Verge Gardens in Woollahra, contact Council’s Environmental Education Officer on 9391 7095.